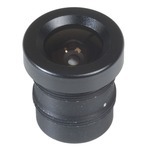 Lenses - L3620 - Only $19.95! produced in the same factory as our full-size C- mount lenses, with the same strict quality control standards. The multi-element design reduces chromatic aberration. Micro Board Lenses are available for use on all Micro Board Cameras. By adjusting the parameters below you can visualize the effects of different lens focal lengths at various distances to a given scene. Contextual help for the parameters is available by hovering the circular help icons. Please note that the images used here were taken with a digital SLR, and are much higher quality than you can expect from a security camera. The purpose of this tool is to simulate field of view, not image quality. HINT: After inputing a number in one of the fields, press [TAB] to recalculate. Disclaimer: The images shown are for the purpose of simulation only, actual results may vary. Simulator Mode allows you to choose from several different scenarios and visualize the effects of various lenses at a fixed distance. This mode limits the parameters to realistic ranges for a given scene. Calculator Mode allows you to input arbitrary values for the parameters, but does not allow you to visualize the scene. The scene selection (available in Simulator Mode only) allows you to choose from several scenarios, to better help you visualize your lens selection. The sensor size refers to the size of the imager array. Choosing the incorrect size will have an adverse effect on the field of view calculations, so be sure and check your camera specifications for the correct size. If you are using the Lens Simulator on a product page, this value will be preset for you. This refers to the distance of the camera from the target scene you are trying to capture, measured in feet. In Simulator Mode, the distance is fixed for each scene and cannot be changed. The focal length refers to the distance between the sensor and lens aperture, and determines how wide or narrow your angle of view is. Shorter focal lengths provide a wider angle of view, while longer focal lengths give a narrower view angle, allowing you to zoom in on distant objects. You can manually input a focal length or use the slider to the right of the monitor. These are the dimensions, measured in feet, of the target viewable area (dimensional field of view); in other words, what you will see on your screen. The target area will be calculated based on the distance and focal length, or you can manually input your target area to find out what focal length you would need for that view.